Explorer Adventure offers exclusive scenic and cultural journey to Tsum Valley known in Tibetan as Beyul Kyimolung which translates The Valley of Happiness an awesome country to visit once in your lifetime to experience its hidden culture and colorful traditional way of life as it was since past hundreds of centuries. Tsum Valley Trekking, an adventure into lost and nearly forgotten areas of Nepal Mid West Himalaya range around upper hills and mountains of famous Gorkha District, the ancient kingdom of Shah Dynasty. Adventure to Tsum Valley Trekking leads you in between great Manaslu and Ganesh Himal range of peaks with views of Sisne Himal towards north, as walk proceeds into green woodland covered within rhododendron-magnolia-pines and oaks and then into complete wild and barren country at Tsum within old farm villages where you can witness the harsh traditional life of the villagers similar to Tibetans across the border. 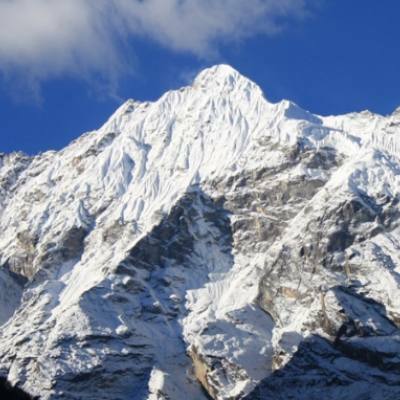 Tsum Valley trekking begins with interesting drive towards warmer mid hills of Gorkha district and then following the same route of Manaslu trail for some days and then off the beaten tracks towards remote and isolated country around Tsum Valley of Happiness. At Tsum enjoy exploring the local ancient Buddhism culture and custom of great fascination visiting its old impressive monasteries of Mu and Rachen Gompa where few travelers often venture in this hidden country. After a wonderful time around high Tsum valley, then heading back on the same trail towards lower areas of Gorkha district for the drive back to Kathmandu with fascinating memories and tremendous adventure on Tsum Valley Trekking with great services of Explorer Adventure. 1 Day 1: Arrival in Kathmandu and transfer to hotels.On reaching Kathmandu Tribhuwan International Airport where you will be warmly received by our guide and staff and then transfer you to your respective hotels in the hub of Kathmandu city. First check into your hotel rooms on getting refreshed from the flight and with Jet-Lag, then join with other members of Tsum Valley trekking for group briefing, where our expert guides will inform regarding your stay in Nepal, hotels, trekking, local lodge and overland drives with do’s and don’ts information, evening welcome group dinner in authentic Nepalese restaurants with Folk cultural programs to entertain you during your meals. 2 Day 2: In Kathmandu with sightseeing tour around world heritage sites.Morning after breakfast leave the hotel for exciting guided sightseeing around Kathmandu where our city guide will lead you to places of interest, Kathmandu a metropolitan city still retains its ancient heritage and varied ancient culture where you will visit world heritage sites around Kathmandu for half day or full day. After an interesting and wonderful tour of ancient historical and religious sites around Kathmandu, with afternoon free preparation for next day early morning drive to Nepal Mid West. 3 Day 3: Drive to Soti-Khola 730 m via Arughat town 645 m -06 hrs.Morning an exciting drive on Kathmandu to Dhading and Gorkha districts on main busy highway for few hours and then heading towards Himalayan foothills, on reaching at Trisuli River within warm sub-tropical area, as our journey continues towards uphill on long winding road towards cooler alpine area past farm villages and town to reach at Arughat town. From Arughat town following Buri-Gandaki River upstream on dirt trail to reach our overnight destination at Soti-Khola, a small farm village slowly turning into a large village a town due to construction of motor-able road. 4 Day 4: Trek to Machha-Khola 930m - 06 hrsStarting our first day walk of the adventure, where walk leads following the raging Buri-Gandaki River upstream, into a gorge covered within dense forest as our route leads to a climb within cool shade of forested areas, after a good walk of six hours then reaching our overnight halt at Machha-Khola. Machha-Khola, a fair size village the name Maccha-Khola means a fish stream, a popular stream for fishing silver craps and other species of smaller fishes. 5 Day 5: Trek to Jagat 1,410m - 06 hrs.With enjoyable stop on this fishing villages, morning walk leads to follow back Buri-Gandaki River upstream for few hours, as our walk leads past Khorla Beshi a small farm village and then on winding path to reach at Tatopani village, a place with natural “Hot Spring,” with time here for hot bathe before heading up to Jagat village. After a refreshing stop, walk carries on past Dovan and Yaruphant villages to reach at Jagat for overnight stops, Jagat a moderate size village with many shops and stores including fair number of simple good lodges to stay. 6 Day 6: Trek to Lakuwa 2,2400m - 05 hrs.From Jagat, walk continues heading higher areas through many small farm villages and then a short climb with downhill crossing over suspension bridge to reach at Nagjet and Philim, a large village with scattered farm houses. After Philim trekking into farm terraces of vibrant golden fields with wheat’s and barley crops, and then walk leads to a climb on rocky ridge top into bamboo forest area towards Dyang village. From here onward leaving the main trail of Manaslu trek, where our route heads further north into remote areas of Tsum. 7 Day 7: Trek to Chumling 2,386 m - 06 hours.After leaving the main trail of Manaslu entering into areas of Tsum, as walk leads from Lakuwa village on leaving behind Buri-Gandkai River for week durations, as our route leads into impressive and charming Tsum in the valley of pure happiness overlooking views of Manaslu and Ganesh Himal on walks. As our morning walk leads into narrow gorge with short down and uphill climb entering within a forest of rhododendron and pine trees, and then walking past few scattered farm villages where climb leads above Lungwa Khola (stream) towards overnight stop at Chumling village right in Tsum Valley. 8 Day 8: Trek to Chokhan-paro 3,010 m - 05 hours.With pleasant and wonderful morning, walking from here onward gaining much elevation heading behind massive Ganesh Himal, into wild country, where time and outside world have forgotten this hidden Shangri-La. Walk leads where tree lines drops along with arid and barren landscapes with villages similar to Tibet as this route also leads across the border to Tibet on this ancient Trans Himalayan Salt Trade trail. Slowly trekking into windswept country to cross a bridge over Smatiking Khola, facing views of Ganesh Himal, the local of Tibetan origin calls Yangra towers high at 7,422 m, as our walk continues to reach our overnight halt at Chokhan-paro village. 9 Day 9: Trek to Nele 3,361m after a visiting Milarepa cave - 06 hours.From Chokan-paro onward adventure gets nearer and higher into upper Tsum areas as walk leads past Nele (Ne-lay), and then climb leads into a scenic wide and open valley within dry and arid country. Walking uphill from here onwards with grand views of snow capped peaks as walk leads to Nele with time for short interesting visit to an old cave of saint Milarepa a popular and famous poet, singer, tantric Buddhist guru of 11th Century, where Tibetans still retains his folk-tales , poetry and songs. After an impressive visit of Milarepa holy meditation cave another hour of good walk brings you at Nele for overnight stop in this quaint sleepy village. 10 Day 10: Trek to Mu Gompa 3,700 m - 04 hours.Today a short walks of few hours to reach our main destination and highlight of the trip at Mu Gompa and the highest spot of the adventure, morning walk leads to a climb into wild terrain similar to Tibetan plateau of dry and arid windswept country. After a scenic high altitude walks reaching at remote and isolated small village of Mu Gompa area, situated on route Tibet border. At Mu with time to visit it impressive old monastery enriched with ancient treasures of idols of various Guru’s and Buddha’s includes age-old scripts and religious books with fine Thangka paintings on walls and ceiling of the monastery. 11 Day 11: Rest day at Mu Gompa to explore the local village and monastery.A rest day here in Mu Gompa, where you can hike around scenic view points and interact with local villagers and explore this traditional village, where travelers hardly visits this areas of Upper Tsum Valley. 12 Day 12: Trek to Rachen Gompa 3,240 m - 05 hours.After a wonderful time around Mu Gompa and its small interesting villages, morning leads downhill to reach another old and impressive monastery of Rachen, as walk carries on pleasant path with few short down and climb past Yak herders shelters to at Rachen Gompa for overnight stop, afternoon with time to explore its ancient and interesting Rachen monastery and the village. 13 Day 13: Trek back to Chumling 2,386 m - 06 hours.With marvelous time around remote and almost forgotten areas of upper Tsum within a valley of happiness in the harmony of pristine wilderness and tranquility, morning leads to long downhill to reach at Chumling village back into tree lines this will be last overnight stop around Tsum valley. 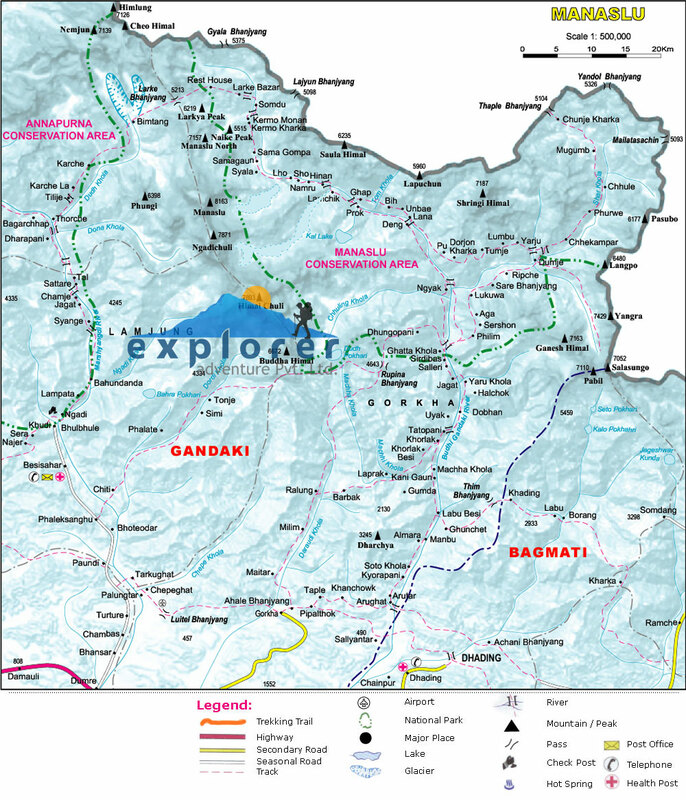 15 Day 15: Trek to Tatopani 1, 240 m - 06 hours.Morning walks to more descend back into much warmer place and into paddy fields, as our journey leads down to Tatopani following the raging Buri Gandaki River downstream past many wide spread farml villages of Nagjet, Sidibas Bazaar and Jagat. Walking further past Yaruphant, and then back into sub-tropical places within green forest and farm land a dramatic change in vegetation and landscapes with warm climate, walk finally ends reaching Tatopani for overnight stop, a village with natural hot spring. 16 Day 16: Trek to Soti Khola 730 m - 06 hours.After a refreshing and pleasant time at Tatopani enjoying time at hot spring, our last day walk leads to Soti Khola, as walk follows Budhi Gandaki River downstream, after a pleasant trek of few hours reaching at Gurung village of Labubesi, from here walks leads beyond terraced fields with views of waterfalls and then completing the last day trek at Soti-khola for overnight stop before heading back to Kathmandu. 17 Day 17: Drive to Kathmandu from Soti-Khola via Arughat and transfer to your hotels -06 hrs.Morning transfer for an exciting drive back to Kathmandu where drive leads to Arughat town within mid hills of Gorkha areas, and then on good road to reach lower warmer areas around Trisuli River and then driving on main busy highway to reach Kathmandu on good time, rest of the afternoon at leisure for individual activities. 18 Day 18: Depart for international flight home ward bound or to respective countries.Your last memorable day in Nepal after a wonderful experience and adventure on Tsum Valley Trekking with great service of Explorer Adventure, and as per your international flight then transfer to Kathmandu international airport for homeward bound or to your respective destinations. Highest elevation gain: At Mu Gompa 3,750 m /16,849 ft high. People and Culture: Mostly Bhotia’s tribes with Gurung and Magar people of Buddhist religion, culture with age-old custom, lower areas of mixed people of Buddhist and Hindu cultures. Walking Hours: From minimum 4 to maximum 6 hrs. Season: April to June and September to November months. March to May wild flowers in bloom with clear morning might get cloudy late afternoon times, October and November clear days for views but can be very cold in the morning and night time above 18,000 m high.